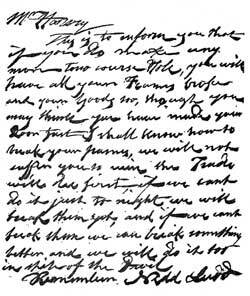 Letter signed by "Nedd Ludd". Letter from 'Ned Ludd's Office' detailing framework knitters' demands to stop the production of 'fraudulent' hosiery on wide frames, 1811 [M 429] A transcript and image of the letter is available online. The correspondence of the 5th Duke of Newcastle refers to the Luddite disturbances. Newcastle was Lord Lieutenant of the county for this period and was responsible for maintaining law and order. See the Learning Resource page on Luddism for transcripts and images of relevant documents from the Newcastle papers.